They are a group of men who work in an overwhelmingly female world. They are used to children forgetting and calling them "Mrs.," they know to check the men's room to make sure no women happen to be in there, and as one put it, "I probably know more about pregnancy than a man should know." These men also say they have one of the most challenging and rewarding jobs in the world: teaching elementary school. "I think it's one of the great secrets. 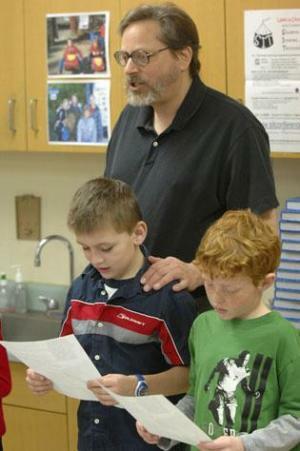 It's a great job," said Bob Connelly, the only man teaching at Tri-Valley Elementary School, Downs. More women have been moving into the formerly male-dominated role of school principal, but men remain a minority in the elementary-school classroom. While men make up about 40 percent of high school faculties, they comprise only about 15 percent of the elementary field at the state and national levels, a percentage that hasn't changed in the last three decades. Having relatively few men in the classroom is long-engrained in American culture and isn't necessarily a problem, says Amee Adkins, an ISU associate professor who teaches future teachers. Men who choose the field have to be out of the ordinary, however, she added. "Child care has historically been seen as women's ground," she said. "Future male elementary school teachers are aware this is an unusual choice to make. In work where you go beyond the normal expectations of society, you have to have courage or you learn to have courage." Having a male teacher is no big deal to Andrea Brown, 9, a fourth-grader at Northpoint Elementary School, Bloomington. Eric Swingler is her first male teacher. "It isn't really any different," she said. Classmate Ryan Teichman agreed, but he noted their teacher's voice is deeper and he is taller, which he sees as a plus. "He can reach higher to write stuff so we have to look up more," Teichman said. "He's very nice and kind and teaches us lots of things," he added. Swingler is one of four men of about 50 teachers at the Unit 5 elementary school. The state-issued Illinois School Report Card says about 15 percent of Illinois teachers are men, and the the National Education Association reports a similar percentage nationally. Local school districts are even lower. The male-female ratio hasn't changed much over the years, said John Pye, Unit 5 assistant superintendent of operations and human resources. While most male teachers were in fifth and sixth grade when Pye started as a fourth-grade teacher 30 years ago, the number in the earlier grades has grown. He noted the biggest change has been in the principals' offices, where women are seven of 15 elementary principals in Unit 5 and three of six in District 87. Being a minority in any profession can lead to some interesting experiences, the teachers say. Connelly, a third-grade teacher, made the pregnancy observation based on his experience as the only man in conversations in the teacher's lounge. "I'm called 'Mrs.' quite a bit," said Ken Hamerlinck, a first-grade teacher at Sheridan Elementary School in Bloomington. Hamerlinck also learned quickly that the word "Men" on the rest room door doesn't really hold when few men work in the building. In spite of these quirks, the male teachers interviewed said the rewards of teaching young children make it worthwhile. "I love the aspect of being around children," said Swingler. They may share experiences, but the career paths male elementary teachers choose differ. Connelly, for example, said he prefers the classroom - he's taught for 26 years - and has no intention of moving into administration. Swingler, on the other hand, has been teaching for about six years and plans to become a school principal eventually. Hamerlinck, who is in his third year of teaching after a 19-year career as a food manager for the Jewel grocery store chain, also wants to stay in the classroom. "I'm definitely not leaving here," Hamerlinck said. "I'm in for the duration." First-grade teachers have such an impact on learning, he explained, adding that while his pupils are fun and cute most of the time, being a good teacher is hard work. It is also more intellectually challenging than some people think, Connelly said. "No job is as challenging as teaching third grade," he said, noting he has worked in retail, factories, delivery and public works. "There's a challenge a surprise and a puzzle every day," said Connelly, adding he does some of his "best work" at recess when he plays kickball with students. Hamerlinck sees another plus. He said that when he has to take the occasional sick day, the children are so relieved to see him return they shower him with kind words. "It's almost a Christmas feeling," he said.